Garden Tower Project > From Kitchen Scraps to Internal Composting to Plant Food! From Kitchen Scraps to Internal Composting to Plant Food! As water is poured on the top to feed the plants, some of the water seeps through the holes running down the length of the compost tube. As this water seeps through the compost tube it absorbs nutrients from the castings and the compost, directly feeding the plant roots and collecting at the bottom drain hole. Water collected in the integrated drawer is poured back on top to organically fertilize the plants. 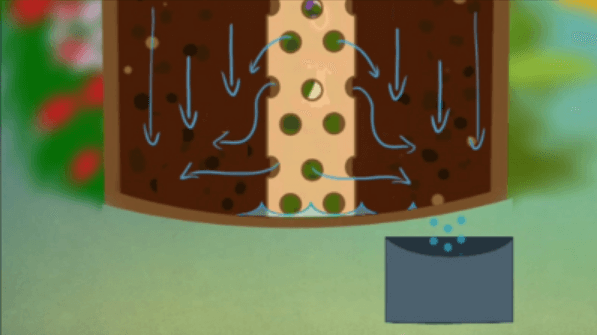 As this cycle repeats, the water collected becomes increasingly nutrient dense. 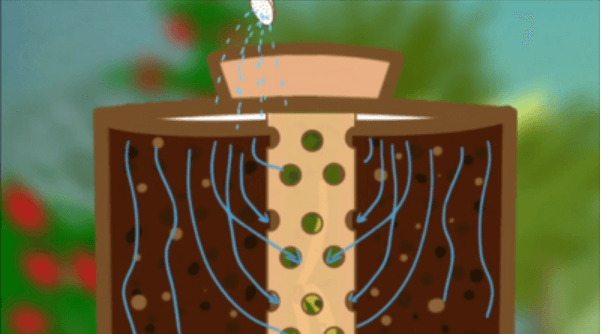 Nutrients made chemically available through microbial processes associated with worm digestion and aerobic composting can now be utilized immediately to produce new plant growth.